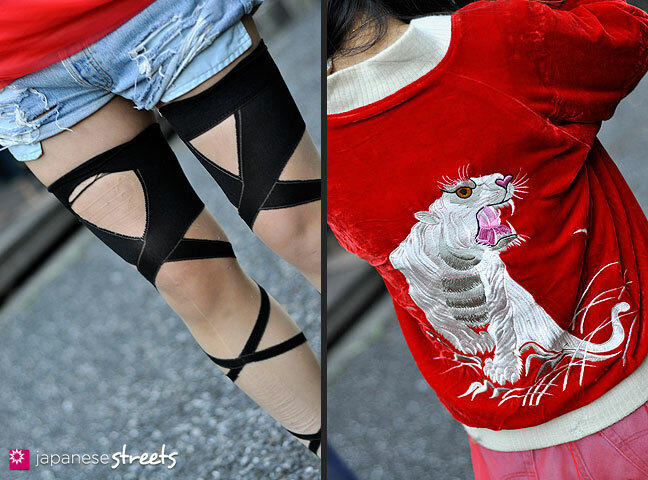 @Maria: Ono Dizon’s stockings do seem similar to Kyary’s ones, don’t they! @2046: I love the yellow Pikachu accent. Tanno-san’s photographs are amazing. There is always something extra that she captures. Wow, this girl had such a great idea with the combo of shorts and long transparente skirt ! 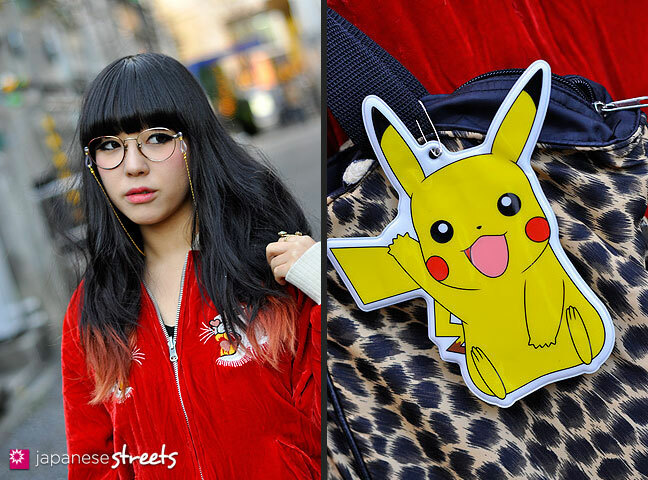 Also it’s been several times that I see Pikachu on some girls outfits, mostly on dolly kei outfit, just a coincidence or ? @Mnon: Character goods are really big in Japan. Very different from what I see in the states, but not that bad. :) Love the glasses. Very cute. I love it. Very traditional Japan meets Cult Party-Kei. 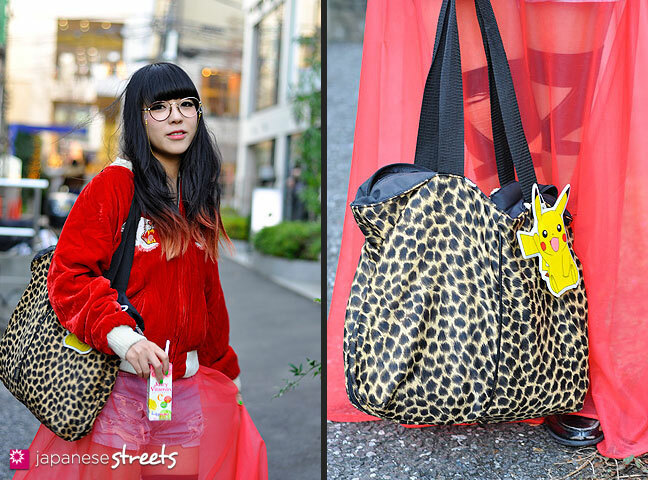 The glasses, Japan tiger shirt, and pikachu accent are spot on with this trend. I love how she layered the sheer skirt over everything. I love it! Actually – that’s a pretty good idea… overall, interesting combo of different things, but as has been said, she’s just super kawaii. @Maria: US people must read magazines to know what to wear, japanese people inspire the magazines so the magazines know what to publish. — Nicely said! @Etsune: Glad you like these shots. Ono Dizon’s hair is very expressive, don’t you think? @Lactose Intoler-Art: Very traditional Japan? @Leah B.: LOL. You will get more chances to be the first! @AdelaideBen: I agree. Even though Ono Dizon style is quite edgy, she still manages to radiate sweetness. @Kjeld: Yeah, her hair IS expressive. The color of the tips makes it seem like her hair is on fire. I LOVE that! @Etsune: The color of the tips makes it seem like her hair is on fire. — I hadn’t looked at it that way. Adds some passion to these images. @Mimi: Excellent observation. Mai uses a 50mm lens, while I use a 24mm lens. We both use Nikon. As you probably know, 50mm is very similar to what your eyes see. I like the 50 mm effect a lot. Maybe I shouldn’t say very traditional Japan, but maybe 1900-1940’s Japan? It just seems antique-ish. @Lactose Intoler-Art: Really? You are clearly seeing something that I am unable to. Which makes me very curious! Here are some links to Japanese women in the 1900s, 1910s, 1920s and 1930s. Let me know if you find a photo close to the image you have in mind. Haha. Wow. Maybe I’m way off this time! Maybe my connection is wrong, but I’m seeing this type of look on trend right now. Maybe I should just explain what I’m seeing. The antique/traditional Japan reference must be off, I’m sorry. haha. Lots of very round spectacles, pre-1940’s American style maybe. These jackets, which I guess I consider traditional, although Japan’s history obviously goes WAYYY back before these jackets. Lots of deep hues, like cranberry, deep red, grays, blacks…Kind of decayed look, in example her shoes. 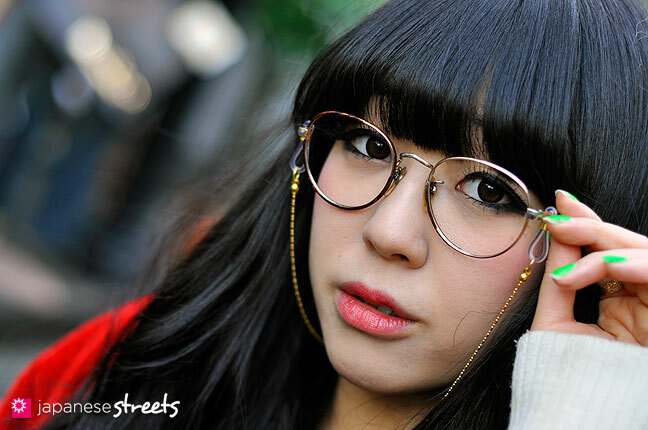 The incorporation of this antique vintage look often also has a random anime character. I think its really cult-party kei but just a little different. Who knows, maybe I’m imagining things. The sheer skirt thing I see too..And for men I also see the antique super round spectacles, and often skirts, robes, traditional sandals, Japanese writing on the textile of the t-shirts/clothing, etc. haha And the guys often have really long black hair, maybe with the tips dyed lighter. @Lactose Intoler-Art: You are spot on with the trend. I think I now also understand where you got the antique feeling for the jacket. This cut is based on an American flight jacket from WWII. After the end of the war many US servicemen stationed in Japan had them embroidered with insignia, tigers, dragons and the lot. There are still lots of companies near US bases in Okinawa that specialize in this business. Wow. Stunning! It’s just so creative and unusual, like nothing you ever see. I would love to try something like this someday, and simply step out on the street in it. Really shows that you don’t need designer clothes to look like a piece of art. @Dahlface: “Really shows that you don’t need designer clothes to look like a piece of art.” — Indeed! 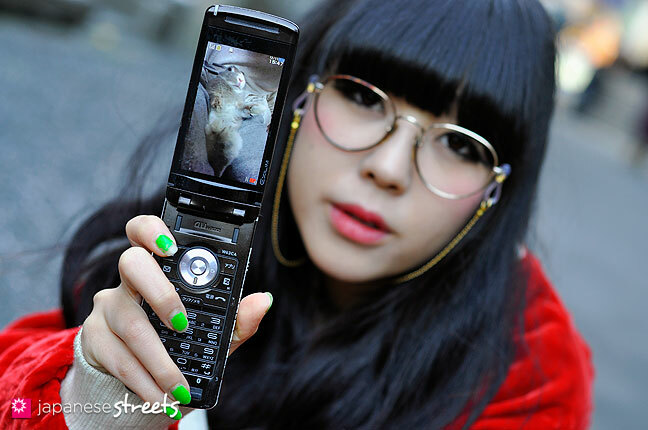 That’s what I love about Japanese street fashion, the incredible creativity. She is stunning. Her fashion sense is amazing. I am loving the sheer skirt look that’s around right now. @ela: Me, too! I love sheer skirts. Especially the ballerina kind.